With our diabetes-management-software-SiDiary you can easily import data from your Ascensia Contour Next Link 2.4 blood glucose meter and use lots of advantages of statistical analysis; trend analysis and graphics to improve your therapy together with your doctor. This picture shows the data transfer from an Ascensia Contour Next Link 2.4 blood glucose meter. 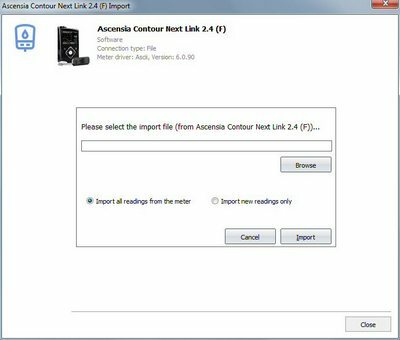 No data cable is required for the data import from the Ascensia Contour Next Link 2.4 (F) because this meter is used to transfer the data from Medtronic pumps to CareLink. The data from this meter will be transferred too, and can then be exported into a CSV file together with the pump data from CareLink. Please do not open/save this CSV file with Microsoft Excel or similar Programs before this file has been imported to SiDiary. Otherwise SiDiary can not find data in it.